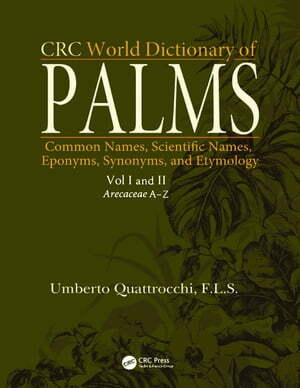 Collins Booksellers - CRC World Dictionary of Palms by Umberto Quattrocchi, 9781351651493. Buy this book online. Umberto Quattrocchi has brought us some amazing and useful works through the various dictionaries that he has compiled. This time it is for two very important plant families the palms and the cycads that are synthesized here in these two volumes. Each entry is fascinating not just for the botany and full nomenclature of the plant species but for all the associated uses, folklore and interactions with other organisms. ...These entries are fascinating glimpses of natural history. ... Botanists, conservationists, ethnobotanists, anthropologists, geographers, bird watchers, naturalists, historians and those of many other disciplines will find these volumes a most valuable and useful resource. It is the sort of book that will be in frequent use in my library. Following the same format as Umberto Quattrocchi’s highly praised and well-used previous works, The CRC World Dictionary of Palms: Common Names, Scientific Names, Eponyms, Synonyms, and Etymology brings together the vast and scattered literature on palms and cycads to provide better access to information on these economically important plants. Each genus and species has a detailed morphological description and includes a list of synonyms and vernacular names in many languages. Bibliographies accompany each entry which are comprehensive, up-to-date and multi-lingual. The detailed information for every entry on habitats, economic uses, historical and biographical data, botanical exploration, and linguistics will be useful for any library involved with botany, herbal medicine, pharmacognosy, medicinal and natural product chemistry, ecology, ethnobotany, systematics, general plant science, agriculture or horticulture.